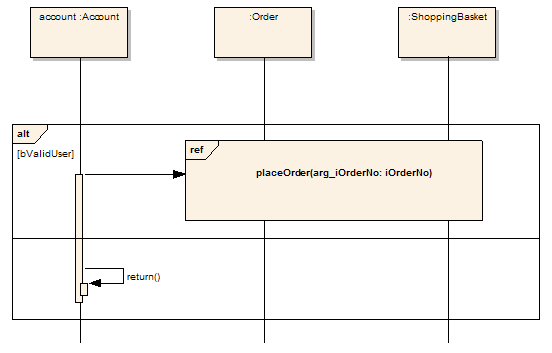 For an Interaction (Sequence) diagram, the behavioral code generation engine expects the Sequence diagram and all its associated messages and interaction fragments to be encapsulated within an Interaction element. Combined Fragments are identified by their types and conditions; for instance, an Alt fragment is identified as an Action If, and a loop fragment is identified as an Action Loop. For more information on the EASL code generation macros and templates Enterprise Architect uses to generate code from behavioral models see the EASL Code Generation Macros topic.